The objective of the EMOTE project was the development of an empathic tutor capable of collaborating with users in the execution of a common geography-related task, adapting its interaction based on the emotional state of the user, the learning process and the task progression. Two showcase scenarios were developed in EMOTE, an individual Map reading scenario and a collaborative scenario on sustainable development, called EnerCities. 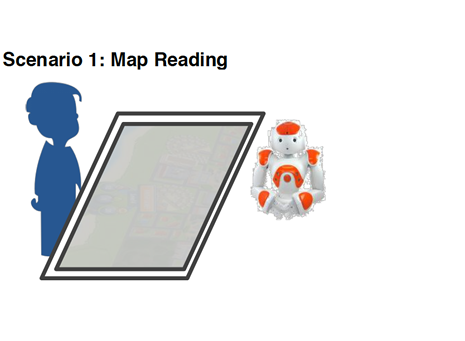 Scenario 1 – Map Reading: One user and the robotic tutor. The user plays a game in which the objective is to find places on a map using the right tools. The tutor describes the tasks the user has to perform and provides help when the user can’t complete the given task. 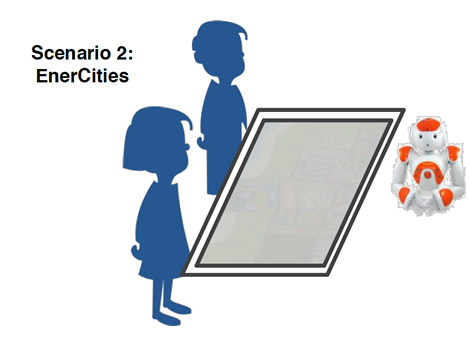 Scenario 2 – EnerCities: Two users and the robotic tutor. The users and the tutor play a customized version of EnerCities together. The objective of the game is to build a sustainable city, taking care of several aspects such as: population, resources, economy, environment and wellbeing of the population. The tutor will play the game as a pair, but it will help the users fostering communication and collaboration between them and explaining game rules and tactics.